In the limited talent pool left in the free agency market, Kevin Seraphin seems like a steal. The French big man has been taking in offers for a while. At the moment, it seems like the Washington Wizards, Los Angeles Lakers and Dallas Mavericks are the three teams left as potential landing spots for him. 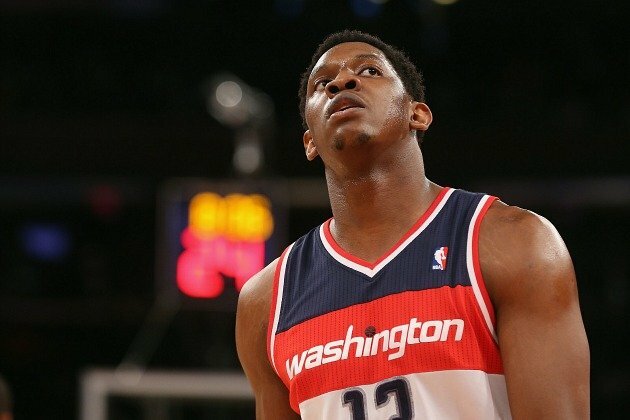 The Wizards would like to keep Seraphin, who has played his entire NBA career for them. He averaged 6.6 points and 3.6 rebounds per game last season in 15.6 minutes a night. While the Wizards can offer him a bit more money than others, there’s the option of playing more minutes on other teams. The Lakers might be in more of a ‘3’ need kind of mood, but they’re not done adding big men as well, and Seraphin could be useful on a team that’s not going to do so well next season. The Mavericks might have bounced back from losing DeAndre Jordan, but they still need more big men to fill in certain rolles. Seraphin could do more there than he might have done up until now in Washington. The 25-year old has been in the NBA since 2010, all of those years in Washington. He was a first round pick in 2010 by the Bulls, but was traded to the Wizards a couple of weeks later along with Kirk Hinrich to the Wizards. During the NBA strike in 2011 he played some basketball with Cholet in France. Otherwise, he’s been with the Wizards, re-signing with them in 2014 after his rookie contract ended. He has averaged 6.4 points and 3.7 rebounds in 326 games for Washington, mostly playing as a center for them last season, although his role has been changing over the years back and forth between the ‘4’ and ‘5’, which is getting harder and harder to distinguish between in today’s NBA.